Box location is Myrtle Ave & Bdwy ...108 1st Due (K2 Capital) Fire is in a Commercial at 376 Vernon Ave. bet Stuyvesant & Lewis Aves. a 1 sty interconnected Commercial BN*37 has it. ....0405 hrs DV*11 orders a Third Alarm....BN*33 flying as Air Recon.... 0424 hrs Fourth Alarm....0434 hrs 1 additional TL to Willoughby Ave rear of the Fire Bldg = 107 acting 111....0443 hrs Car 11 Chief Esposito reports all Members out of the bldg Roll Call being conducted DWH.... 2 inadvertant Emergency Alerts.....0520 hrs Car 9 Chief Baggot reports 2 multi versals & 2 TLs in op...additional TLs being setup...extension to exp 4...Con Ed forthwith.....0558 hrs now a Fifth Alarm...LAD*15 acting 105 & 120 into the staging area at Myrtle & Lewis....ENGS ..221...234...210...240/211...BN*41....0608 hrs multiple collapse's of the roof of the Fire bldg & the exposure & front wall of the exposure still DWH. ...0649 hrs TLs multiversals & handlines in op from the exterior....special call 3 BCs... BN*46 going. 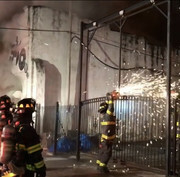 Re: BKLYN FIFTH ALARM 779. 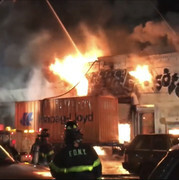 Re: BKLYN FOURTH ALARM 779. [/quote Acting Chief Of Operations John Sudnik. Think car 4 said acting didn't catch the rest thanks for reply. Listening to Brooklyn radio just heard TL86 act TL159 and L82 act L168. Not very often that you hear two SI ladder companies relocating to Brooklyn. WOW - waking up to another biggie, this is getting to be hobbit!!! 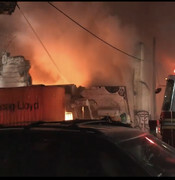 ( FDNY BIX 779 - BROOKLYN ) - FDNY BATTLING A MAJOR 5TH ALARM FIRE IN A COMMERCIAL ESTABLISHMENT ON VERNON AVENUE IN THE WILLIAMSBURG AREA OF BROOKLYN IN NEW YORK CITY.